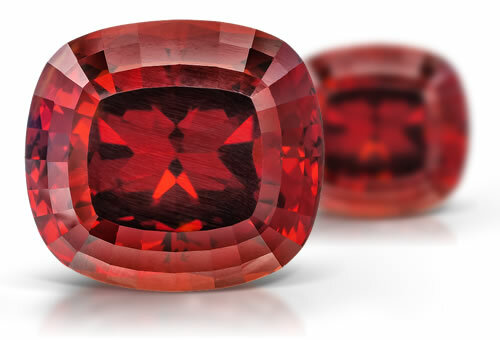 Discovered in the mid 1960's in Tanzania's Umba Valley, this red-orange to pink-orange variety of garnet was originally thought to be spessartite garnet. Actually a mixture of pyrope and spessartite garnets, these gems are lively thanks to their sparkling red flashes. Once discovered not to be spessartite, they aptly became known by the Swahili word malaia, meaning "out of the family". RI, SR nature, magnification, and possibly spectrum. Lack of pleochroism makes clear separation from alexandrite. Malaia garnet comes from the Umba Valley in Tanzania and are yellowish-brown, brownish pink, cinnamon color, honey brown, reddish brown to brown-orange.Umbalite garnet comes from the Umba Valley in Tanzania and are light pink to purple.Color change garnets are generally intense pink to red under incandescent light and greenish yellow in daylight or fluorescent light or teal to purple color change. Pyrope-spessartite is a type II clarity stone. Stones sometimes contains rutile, apatite and pyrite mineral inclusions and intersecting needles.